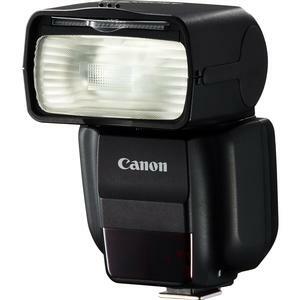 A shoe-mount flash with functionality, power and style. For stunning flash photography even in complex lighting environments, Canon's Speedlite 430EX III-RT offers a fantastic combination of advanced features and simple operation. Compact in size, yet powerful in range, the Speedlite 430EX III-RT not only provides a portable light source, it has easy to manage features that can enhance contrast, color temperature, brightness and focus of light for more natural-looking photography. Whether bouncing the light source off a wall or ceiling, using its integrated Catchlight panel to brighten up a subject's face, or using its bounce adapter to soften the intensity of the flash beam, the Speedlite 430EX III-RT is impressively versatile. With convenient custom and personal functions, speedy recycle times and advanced wireless photography options, the Speedlite 430EX III-RT can be an indispensable accessory for photographers ready to take their flash photography to the next level. For advanced flash photography on the go, the Speedlite 430EX III-RT is efficiently designed to incorporate a number of options in a compact, lightweight and portable package. It's considerably smaller than its predecessor, has a compact head with a redesigned optical zooming mechanism and, like the 600EX-RT, has a refined exterior for good looks and intuitive operation. 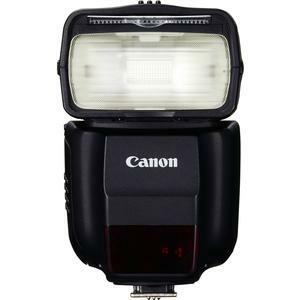 This Speedlite has a maximum guide number of 141 ft./43m at ISO 100, and flash coverage of 24-105mm, 14mm with its integrated extendable wide panel in use (full-frame). Whether taking portraits or group photos, working close or from a distance, the Speedlite 430EX III-RT has the power to illuminate the subject at hand. 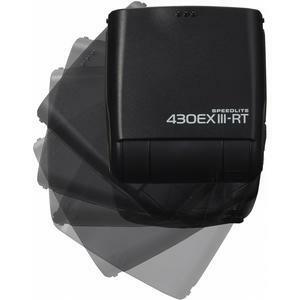 The Speedlite 430EX III-RT incorporates a number of features designed to provide excellent results, simply. 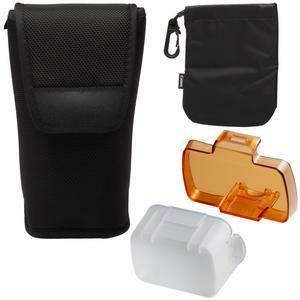 Its built-in, extendable Catchlight panel can softly brighten faces for a more natural look and can better capture facial expression. Plus, it helps reflect illumination from the flash onto the subject's eyes. 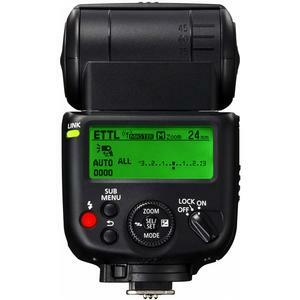 The Speedlite 430EX III-RT's Dot-matrix LCD has a clear, easy to read Graphic User Interface (GUI) so all settings can be seen. Its new, easily operated Control Dial makes selecting and changing flash settings a breeze. By aiming the head of the flash at a wall or ceiling, a broad, soft and even illumination can be achieved for more natural-looking photography. The Speedlite 430EX III-RT has an improved bounce range: it can be moved up from 0-90°, can be rotated 150° to the left and 180° to the right. With this flexibility, it's easy to experiment with bounced flash, and to find just the right setup for compelling portraits, still life or other creative photographs. For comprehensive lighting setups on the go, the Speedlite 430EX III-RT offers a number of options for both wireless flash and multi-camera operation. When used with a compatible flash, or flash driver mounted on camera, the Speedlite 430EX III-RT can serve as a slave unit in an optical setup, at distances of up to 49.2 ft./15m (indoors). 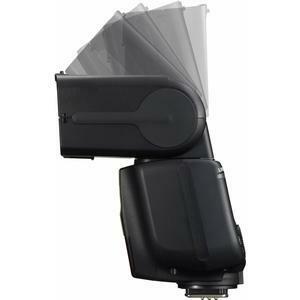 In addition to optical wireless flash, the Speedlite 430EX III-RT is capable of radio transmitted wireless flash where the flash units need not be in visual proximity to one another and transmission distance is extended up to 98.4 ft./30m. Among cameras with the Speedlite 430EX III-RT attached, setups of up to 15 flash and camera units can be synchronized to take photographs simultaneously, making multi-angle and multi-directional photography setups simple. Additionally, remote shutter release can be achieved when the Speedlite 430EX III-RT is used as a slave unit with a compatible EOS digital SLR. 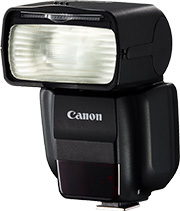 The Speedlite 430EX III-RT has an improved flash recycling time and quick flash mode and can repeat as quickly as 0.1/sec. for excellent, reliable performance. This is especially helpful in portrait and sports photography when expressions and actions can change in an instant. With shorter recycling times, the opportunities to capture a precise expression or a specific moment are increased, time and again. The Speedlite 430EX III-RT features both enhanced flash exposure compensation and an advanced light distribution feature for more control over the intensity and direction of the beam emitted. Perfect for balancing the brightness between subject and background, flash exposure can now be adjusted within a 6-stop range of +/-3EV, and in increments as small as 1/3 or 1/2 step, all using the Speedlite 430EX III-RT's new Control Dial. Light distribution can also be altered from Standard according to the photographer's intended field of view. Guide No. Priority mode automatically sets flash distribution toward the center of the composition for use with a telephoto lens. Even Coverage mode sets flash distribution for wide-angle photography, helping to minimize light falloff in the corners of the composition. In addition, the Speedlite 430EX III-RT features high-speed sync, which not only enables flash photography of fast moving subjects, it's also a useful tool to help add drama and depth to daytime photography. By using the Speedlite 430EX III-RT with a large aperture setting, a fast shutter speed and high speed-sync, it can be easy to capture the subject with even illumination, while blurring the background, highlighting the subject and creating an effective sense of depth. To help ensure comfortable and intuitive use no matter the photographer, the Speedlite 430EX III-RT has a number of custom and personal functions that are easily defined in the Speedlite 430EX III-RT's menu system. Custom Functions include measurement indications, power controls, powering of modeling flash and AF assist beam, light distribution settings, exposure compensation settings, wireless flash settings and more. Personal Functions include LCD color and contrast for both Master and Slave flash, quick flash settings, dial settings and more. When Custom and Personal Functions are tailored to the particular user, the powerful Speedlite 430EX III-RT can become even faster and simpler to use. Recycling Time: Normal flash: Approx. 0.1-3.5 sec. Quick flash: Approx. 0.1-2.5 sec.